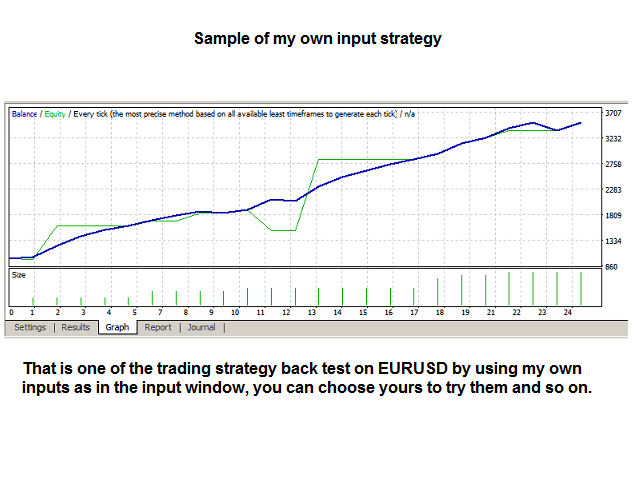 My own indicator which is already (in mql5 market) showing the dynamic support and resistance also can act alone. 2 CCI indicators added to support the first indicator or both can act alone if the first indicator is CheckTrendLine=false. Automated lot size calculator by LeverageUse=true or you can use ordinary lot size number in FixedLot=0.01 & up. Orders like: Stop Loss, Take Profit and Trailing option to true/false. (This Trailing order is act after positive profits only). Many other functions like hedging CloseOnOppositeSignal and when to start the trade after the ConfirmCross. Many other functions to display information on the chart. This EA is working on all currencies and commodities, Indices and stocks for MT4 friendly users on all time frames. You just need to try your own inputs and make the back strategy test on any product on any time frame. I have combined both indicators to build up your own EA. CheckTrendLine=false/true to activate the first indicator (My own indicator). 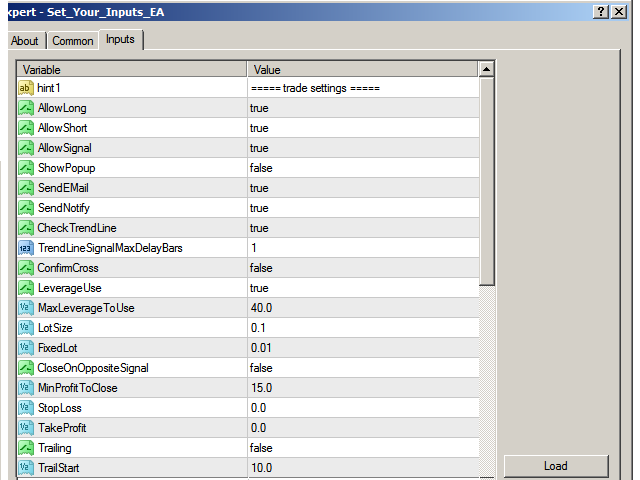 Cci1, Cci2 Enabled=false/true to activate the CCIs indicators with its variables. The Cci1 will start to act only after the confirmation conditions of Cci2. This trading EA can generate trading signals by AllowSignal=true and SendNotify=true so you can send signals to your MT4 mobile. If you turn ShowPopUp=true then pop up window message will show up the written signals on time. TrendLineSignalMaxDelayBars=1 that is meant the confirmation of any buy or sell signal will be confirmed after the first candle bar is completely formed after the broken red trend line comes above or below the red line. By place 2 or 3 only if you want the signal confirmation delay after 2 or 3 candle bars have crossed the existing trend line. ConfirmCross=true to confirm the CCI crossed over the CCI inputs levels. If =false, then the confirmation of the signal will be generated right after any cross or just touch the CCI passed the input levels without confirmation. 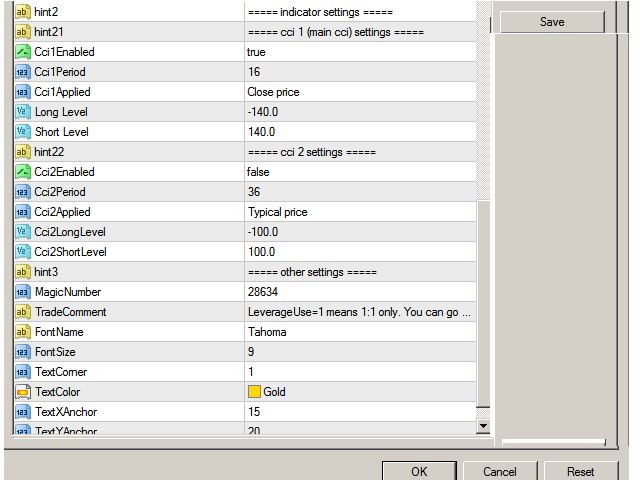 LeverageUse=true the leveraged trades calculator. I have added this smart calculator to allow users to manage the leverage use by multiplying the numbers that you have placed in MaxLeverageToUse= 1 or 2 or 3 up to 100 times X your equity balance in your account. So, you can place 1 which is meant to be 1:1 leverage use in each trade. If you place 2 then the EA will multiply the number 2 with this equity and choose the equal number of lots: It is by dividing the total value over the product price then it will choose the standard lot numbers equal to trade it. It will keep calculating the new equity which is increased by the added or debited profits with time and so on. LotSize= from (1 to 0.1) like 0.5 or 0.3 or 0.4 or 0.2 or 0.25 or 0.1 this is if you want the EA to divide the chosen lot size out from MaxLeverageToUse into parts. 0.5 means 2 parts = 2 possible trades when there is a signal. If 0.1 then it will divide the sum lots into 10 equal parts or trades whenever there is new coming signal at the same direction and so on. CloseOnOppositeSignal=false this function is not closing the open trades (Buy or Sell) until they turn into profits then it will close them with total profits equal to MinProfitToClose=15 pips as example. 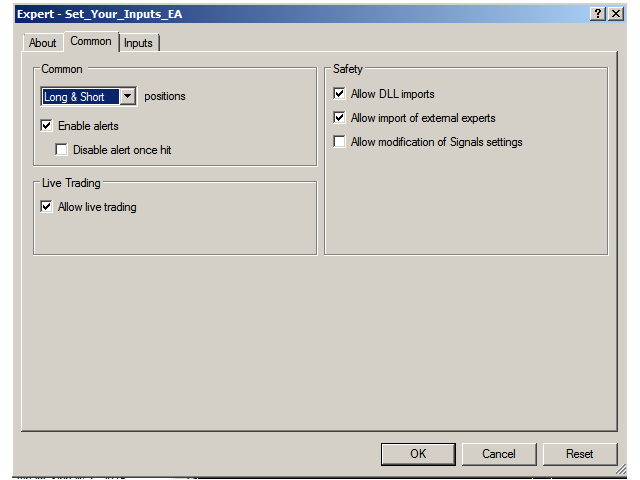 Stop Loss, Take Profit and Trailing orders are all ready under your control using pips inputs in case of currencies and just add extra digit to place pips inputs for metals and other commodities or indices. Finally; I hope every one can build up his own secret strategy by using this open EA inputs after successful back strategy test. I don't promise any profits or successful strategies by using this tool but I did have found successful one and it is on market for sale. 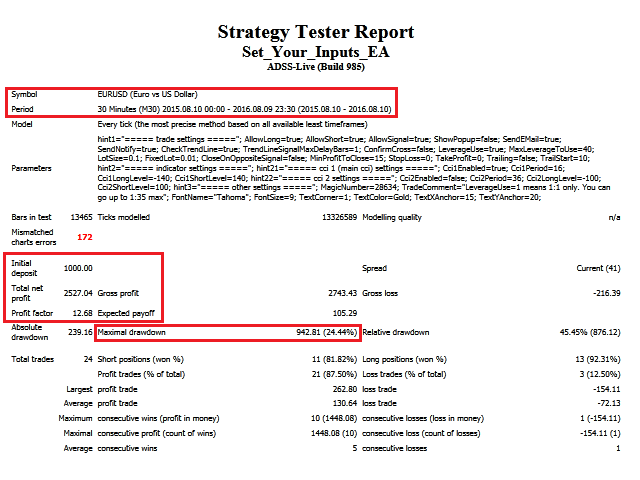 Important: You have to know that the data provided is varied from broker to broker, I advise you to make successful strategy test on your broker platform before using it on live. Very informative and worth the money. I learned a lot from Sami, his system is great and I will continue to try it and give updates about the results.